Promotional giveaways begin on April 6th with a first of its kind, spinning Cucuy bobblehead giveaway thanks to Crown Connect. Living legend and former 66er Mike Trout appears three times, including one bobblehead (May 25th, courtesy of Sunergy Construction Inc. followed by Operation: GLove's postgame Beer Mile), one jersey (July 20th presented by ReMax Advantage & Lakeside) and a hat on August 23rd. Two additional hats will be given away this year including a camo hat presented by Navy Federal Credit Union on Armed Forces Day May 11th and a California State themed hat sponsored by Raising Cane's on June 29th. On Saturday, April 20th the 66ers will pay homage to a fellow Southern California athlete with a "LeBron" reversible James/Tune Squad jersey presented by LifeStream. On June 8th the 66ers get ready for Toy Story 4 with a Bernie and Slick "You've Got A Friend in Me" double-bobblehead. Two other Saturdays feature a second chance at an item given away at Angels Stadium earlier in the season. Select Friday dates spotlight exciting firework shows, with the return of the largest fireworks show in the Inland Empire on July 4th. Throughout the year the 66ers will hold special theme nights that fans will undoubtedly anticipate like Super Hero Night presented by Comic Con Revolution on May 10th, Star Wars Night on August 24th and Bernie's Birthday on July 5th. New and exciting theme nights planned for 2019 include Space Jam Night on April 20th as well as California Burritos Night on May 25th (the 66ers will be transformed into the California Burritos, a tribute to an Inland Empire favorite food). The Sixers will bring back the classic Christmas in July on July 20th but with a twist (follow the Sixers on social media for hints). Visit https://www.milb.com/inland-empire/ballpark/promos to learn about all the promotions ranging from silly to civic. 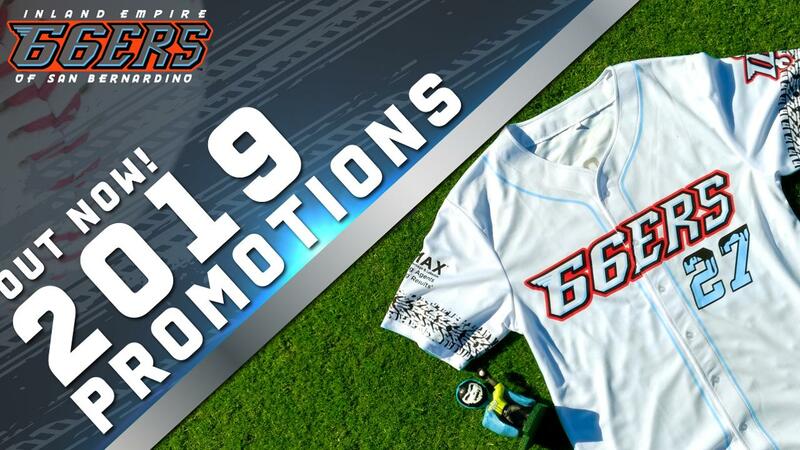 "We always try to up the ante when it comes to our promotional schedule and 2019 is no exception," General Manager Joe Hudson said. "66ers fans deserve the best and we feel we have put together the most creative offerings in the game." The beloved Weekly Promotions from 2018 have all been retained. Fans can bring their dogs to the ballpark for Man's Best Friend Mondays. $2 Tuesdays will entail $2 tickets, hot dogs, soda, popcorn and Sophia's Tacos. Feel like a winner on OmniTrans Winning Wednesday when you bring your OmniTrans bus pass for two free tickets. Summer temps are no match for Budweiser's Thirsty Thursday featuring $3 beers or $3 sodas. Guests can spare their wallet on Toyota of Redlands .50 Cent Friday with .50 cent hot dogs, $2.50 lawn seats, $2.50 sodas and $5 beers. The 66ers will also honor all military and first responders each Sunday with 50% off all seat purchases for those public servants. Fans can find a full listing of the 66ers Promotional Schedule as well as purchase discounted season tickets on 66ers.com. Seats can also be secured by calling the 66ers front office at 909-888-9922; ask about the 2019 Cal League All-Star Game.